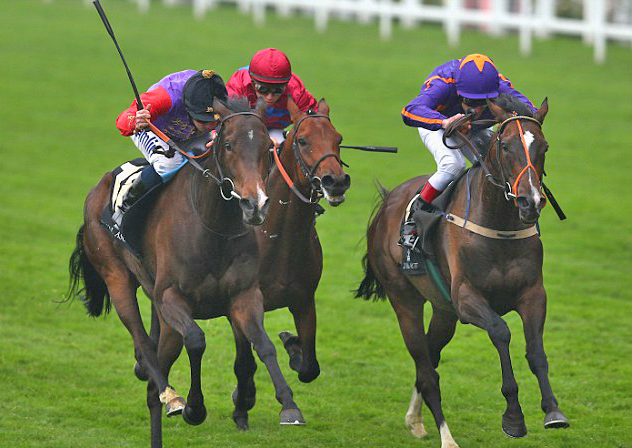 When Estimate won the 2013 renewal of the Ascot Gold Cup she became the first runner owned by the reigning monarch to win this prestigious race. 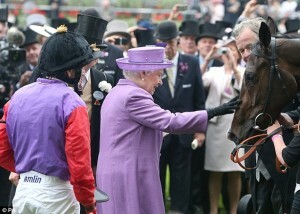 The royal family had won all of the other classics but this would be their 1st victory in the Ascot Gold Cup. 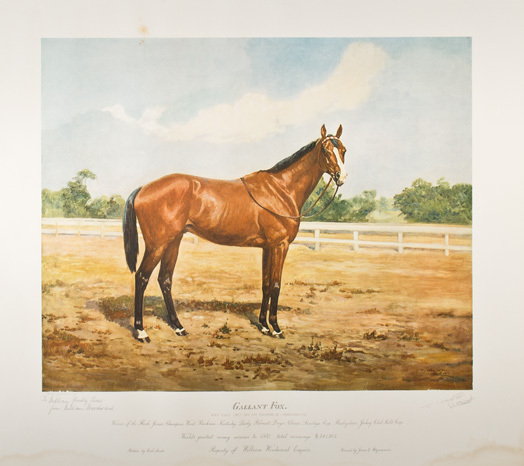 Before we take up Queen Elizabeth II’s Ascot Gold Cup winner, Estimate, let’s look back in time to another classic winner racing in the colors of another reigning monarch King Edward VII. The horse is Minoru and there is an interesting story associated with him. Minoru’s breeder was Col. William Hall Walker an eccentric brewer from Liverpool. Hall Walker insisted on knowing the exact time of a foal’s birth so that he could cast their horoscope to determine their fortune. Hall Walker was convinced that Minoru’s horoscope made him a sure thing for the Derby. With this bit of information in mind he convinced Lord Marcus Beresford (racing manager to King Edward VII) that a win in the Derby by the reigning monarch would enhance popular support for the Monarchy. The late Abram S. Hewitt describes the race in Great Breeders and Their Methods. The question is, was it the horoscope of Minoru that convinced Col. Hall Walker that he was a sure thing to win the Derby or was it his pedigree? When we look at Minoru’s pedigree it is evident that his pedigree contains the same pattern found in the Queen’s latest classic winner Estimate. The pattern is male line reinforcement of the tail female line. If you look at the pedigree of Mother Siegel the dam of Minoru, her 4th dam is Chanoinesse, a full sister to Hermit, while her sire Friar’s Balsam is a son of Hermit. This pattern when found in the female line is a harbinger to emerging classic ability. The story of her majesty’s wonderful mare Estimate is an interesting one which like the story of Diadem contains a road map to classic success. The story begins in 1920 when Marcel Boussac began to establish what was to become the dominant stable in French racing. The key event which would lead to the eventual breeding of Estimate was the death in 1919 of the American breeder Herman Duryea. Marcel Boussac bought from Duryea’s widow all of the yearlings in the Duryea crop and with the exception of 1920; he continued this practice for as long as Mrs. Duryea bred thoroughbreds. Among the 1919 crop of yearlings was a daughter of Durbar II to be named Durban. 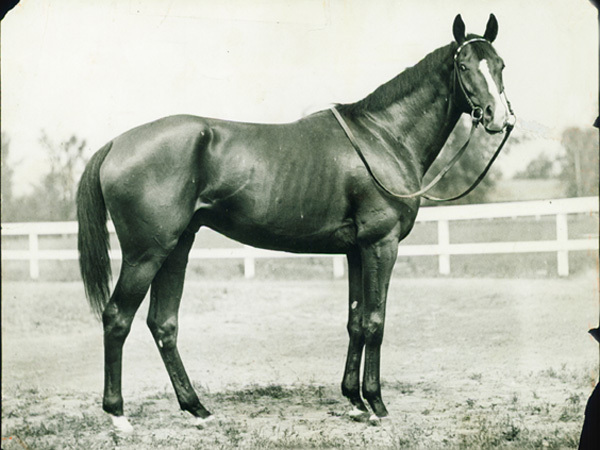 Then from the crop of yearlings purchased from Mrs. Duryea in 1922 he obtained Durban’s full sister Heldifann. The difference between the two was that Durban was to become a first class race mare winning the Grand Criterium and Prix Vermielle while Heldifann won only the minor Prix de Petit Couvert. 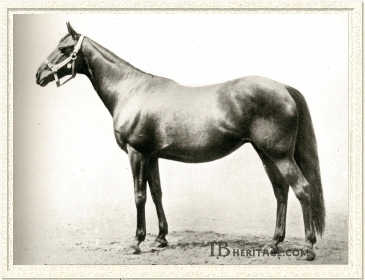 The 2nd dam of Durban and Heldifann is Frizette whose female line would later produce the great sires Mr. Prospector and Seattle Slew. What separated the Boussac breeding program both before and since was his practice of breeding to only his home stallions. In effect the Boussac Stud was a closed breeding program. This was further complicated by the fact that of the 4 stallions which became the mainstay of the Boussac Stud he bred 3. The stallions were Asterus, Tourbillion, Pharis, and Djebel. Of the 4 only Asterus was not a home bred. Because Boussac bred three of these four stallions and because he didn’t breed to outside stallions it was inevitable that sooner or later these stallions would be crossed back to mares from their own female lines. This is a pattern that recurs though out the history of the breed with outstanding results. In effect it is the key way to concentrate classic speed. If we look at the 4th dam of Estimate we see how the Boussac breeding program progressed. Heldifann was bred to Asterus to produce Djezima. Then Tourbillion (a son of Durban) was bred into the female line to produce Tourzima. This mare is a typical example of how to concentrate classic speed and to produce what Dennis Craig calls a cluster mare. Tourzima is the result of using a stallion to reinforce the female line. Finally Tourzima is bred to the 3rd of the Boussac stallions, Pharis to get Albanilla. As a broodmare Corejada might be considered even better than she was on the racecourse. 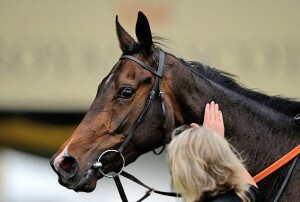 She is the dam of Macip who won the Ascot Gold Cup at 2 ½ miles and the Prix Royal Oak run over 3,000 meters. When she was finally mated with Djebel (the fourth of the Boussac home stallions) she produced the wonderful Apollonia. As a two-year-old Apollonia won the Prix Morny, Prix Yacowlef and the Grand Criterium. At three she annexed the Prix De Diane (French Oaks), French 1,000 Guineas, and Prix De La Grotte. Look at her pedigree and you will see that she encompasses all four of the major Boussac stallions. Apollonia’s sire is Djebel, her dam is by Pharis, her granddam is by Tourbillion and her great granddam is by Asterus. When Marcel Boussac looked for an outcross for Apollonia he unfortunately chose Iron Liege a beautifully bred Kentucky Derby winner by North America’s leading sire Bull Lea. He had no way of knowing that all of the Bull Lea’s would fail as stallions. 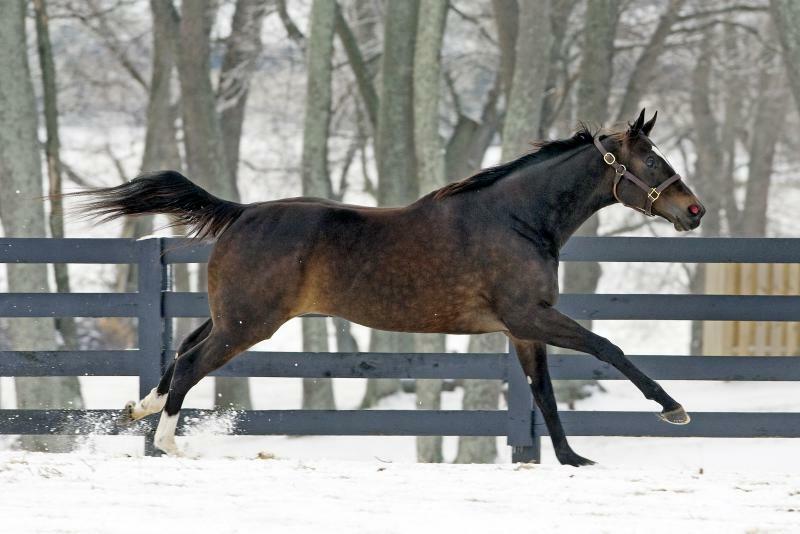 Corejada had a full sister named Albanilla who would become the 4th dam of Estimate. There followed two more generations of out crossing in as the stallions Dan Cupid and Ela-Mana-Mou were bred into the female line, these are the out crossed generations from the Ken McLean axiom, then reconcentration must take place. It comes in the form of Darshaan as the sire of Estimate’s dam Ebaziya. 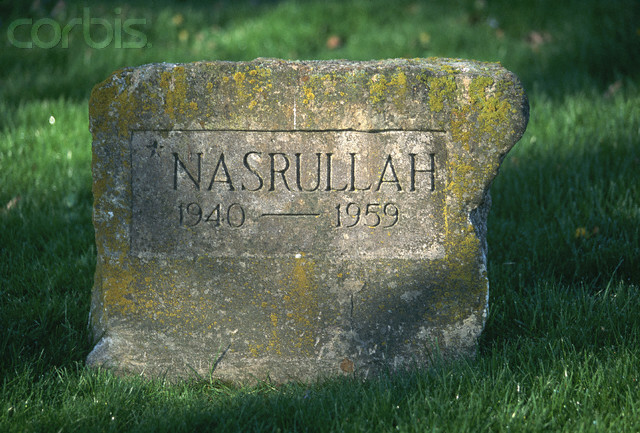 First and foremost is using Darshaan as a reinforcing stallion is the fact that he traces to Albanilla as does Ebaziya. Since Albanilla’s dam Tourzima has a double cross of Banshee through the full sisters Durban and Heldifann this would give Ebaziya 4 crosses of her own direct female family. Abdos is a great grandson of Tourbillion whose dam is Durban. Abdos won the Grand Criterium from only two starts as a two-year-old and he wasn’t a great stallion in the declining era of the Marcel Boussac Stud. However, he made a very significant impact on later pedigrees and that came about whenever she was used as a reinforcing stallion for mares descending from the inbred Tourzima. 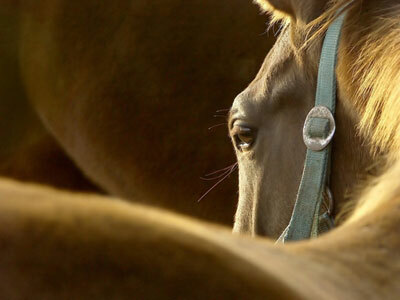 Three mares benefited from the reinforcing influence of Abdos. The first is Delsy, she being by Abdos with her 4th dam being Tourzima. She is the dam of Darshaan, and Darara. Darshaan won the Prix du Jockey Club defeating Sadlers Wells and Rainbow Quest. Darara won the important Prix Vermeille G1 and then produced 4 champions and 5 G1 winners from 12 foals. The total earning of her 12 offspring is a combined 7,250,000 pounds. The second mare from the Tourzima family to benefit from the reinforcing influence of Abdos is Licata. She is by Abdos with her 3rd dam being Tourzima. 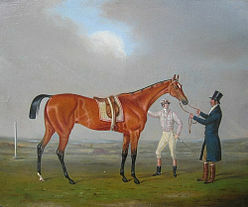 Licata is the dam of Acamas, winner of the Prix du Jockey Club, Akiyda victor in the Prix de l’Arc de Triomphe, and Akarad who annexed the Grand Prix de Saint-Cloud, and was 2nd in the Prix du Jockey Club. Finally, there is Stoyana who is by Abdos with her 2nd dam being Tourzima. 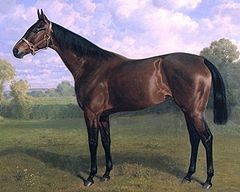 Stoyana is the 3rd dam of Sinndar who is the only horse ever to win the Epsom Derby, the Irish Derby and The Prix de l’Arc de Triomphe in the same year. The story of Estimate follows the Ken Mclean axiom of first concentrating classic speed then breeding away from it before re-concentration. Although Ebaziya, the dam of Estimate is the result of reinforcing the Tourzima female line, her daughter is by a Stallion (Monsun) that is a total outcross to the this blood. The question remains is it possible for her majesty Queen Elizabeth II to keep this process going? When one considers that this process started 75 years ago it becomes ever more difficult to find a sire from this female line to use as a reinforcing vehicle. However, there is one possibility. The logical stallion with whom to cross Estimate is Sinndar. 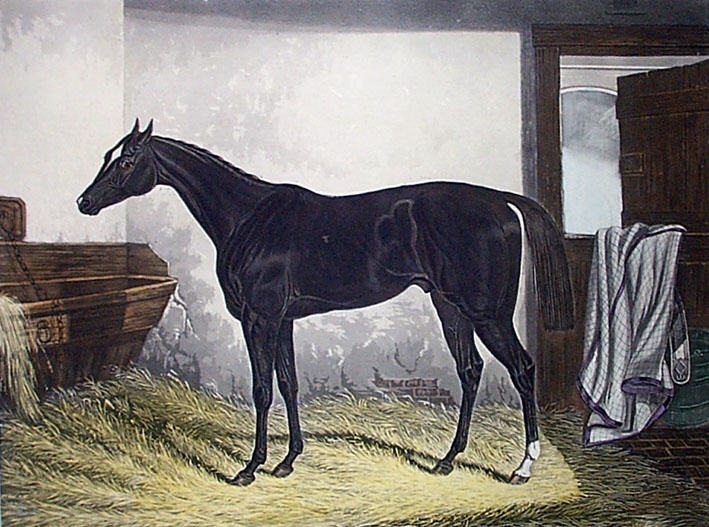 He was an exceptionally good racehorse although not as good in the breeding shed as a stallion as he was a runner, He is the only horse to win the Epsom Derby, Irish Derby, and Arc in the same year. He has sired Youmzain winner of the Preis Von Europa G1, Grand Prix De Saint-Cloud G1 and 2nd 3 times in the Prix d’Larc de Triomphe G1. She has also sired Shawanda who won the Irish Oaks, and Prix Vermeille. Shareta another daughter of Sinndar ran 2nd in the Arc, after victories in the Yorkshire Oaks G1, and Prix Vermeille G1. What makes Sinndar such a good cross to Estimate is that he is a direct descendant of Tourzima and has the reinforcing presence of Abdos as well. It should be brought to your attention that Estimate has a half-sister by Sinndar named Ebaza. While Estimate is a G1 winner of the Ascot Gold Cup her sister Ebaza was unplaced in 3 starts. However, Ebaza is off to a good start as a broodmare having produced a filly by Maria’s Mon named Emiyna who won the Athasi Stakes G3 and ran 2nd in the Desmond stakes G3. A filly foal by a mating of Sinndar to Estimate would have three direct crosses of her own female line, the 1st from Sinndar, the 2nd from Darshaan and a 3rd from Estimate’s tail female line which leads directly to Tourzima. When you consider that Tourzima herself is inbred to her own female line it results in a Sinndar-Estimare foal having 6 direct crosses of her own family with several more collateral crosses thrown in for good measure. Now the sixty four thousand dollar question remains, what does all this mean? For the answer we have to go back 50 years to a book by the unheralded researcher Dennis Craig and his book Breeding Racehorses From Cluster Mares. Dennis Craig found that 66% of the 861 winners of the eight most important races in England up to the end of 1960 trace, within six generations, to only 130 broodmares. Out of these, 80 broodmares produced winners of 5 or more of these races and he called them cluster mares-while the remaining 50 broodmares produced winners of 3 or 4 of these races and he called them star mares. My own research which is complimentary to Dennis Craig’s shows that when you concentrate the blood of one female line into one individual using the stallions as reinforcing mechanisms you concentrate classic speed. That is what a Cluster Mare represents; A concentrated form of classic speed. If you were aware of this concept it would be easy to see that Ebaziya who has already achieved star mare status is almost surely going to become a cluster mare in the not to distant future. What makes me so sure this will occur? She is inbred to her own foundation female family (that of Banshee), but more importantly she has 10 very well bred daughters. Ebaziya has already produced three individual winners of four of the required races. 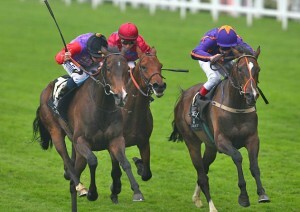 Estimate (Ascot Gold Cup), Enzeli (Ascot Gold Cup), Ebadiyla (Irish Oaks, Prix Royal Oak) but she did it in one generation. She has another 5 generations of 50 or 60 more years to produce one more classic horse from her family to earn cluster mare status. The sires of her daughters are; Sadlers Wells (2), Rainbow Quest (2), Machiavellian, Sinndar, Refuse to Bend, Indian Ridge, Monsun, Dubai Destination. With some of these females being in the hands of such luminaries of the turf as H.H. Queen Elizabeth II, H.H. the Aga Khan and Will Ferish, expect this family to continue to produce at the highest level. Until then dear readers I wish you all the best of racing luck.